The journey is difficult, immense. We will travel as far as we can, but cannot in one lifetime see all that we would like to see or to learn all that we hunger to know. 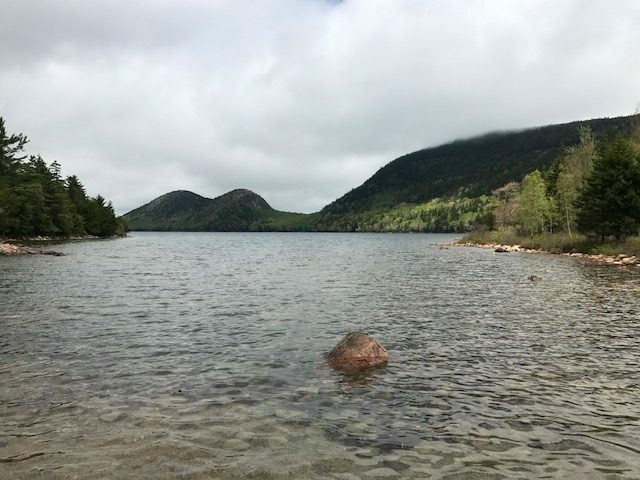 After our stop in Rhode Island, we continued north to Maine and into our final park for this particular quest, Acadia. It was awfully exciting to cross over that last state border and then enter Park land! Last year, our goal was to visit New England in the fall, to see the fabled colors of the changing leaves. And, seeing the variety of trees displayed across the hills, we can only imagine that they live up to the descriptions. However, we’ve really been loving the underrated spring colors – vibrant shades of green with splashes of white, pink and purple as the flowering trees are blooming and showing off. Plus, since we visited just before Memorial Day there were only a handful of other visitors in the area. Some of the stores and campgrounds were not yet open, but with more of the park to ourselves we were more than satisfied with the trade-off! 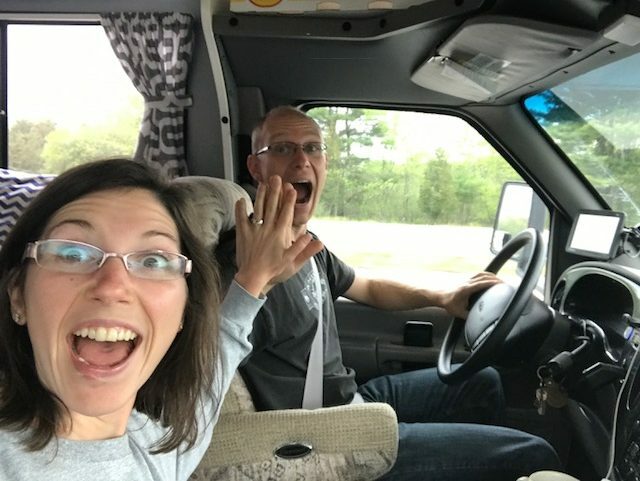 The moment we crossed into Maine. Last state! 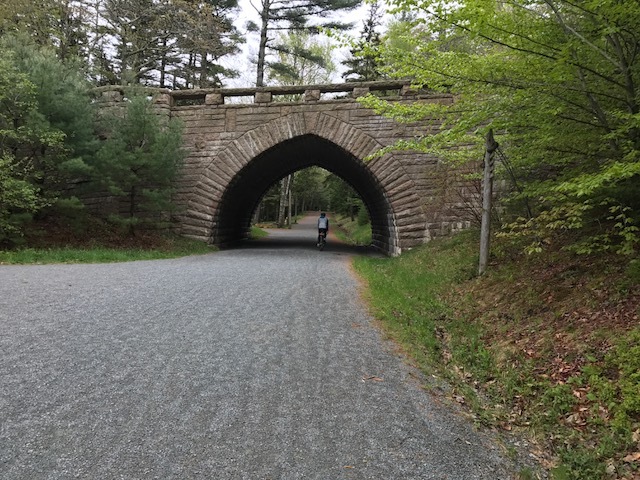 Heading into the Mount Desert Island portion of Acadia, we parked at the visitor center and hopped on our bicycles to tour the gravel carriage roads through the park. We pedaled past some amazing views of and over Eagle Lake and Jordan Pond and ate lunch overlooking Bubble Pond. Back at the RV we traded pedal bikes for the motor bike and worked our way down half of the park loop and back up through the town of Bar Harbor. It was finally check-in time at the campground so we headed that way to get settled for the night. 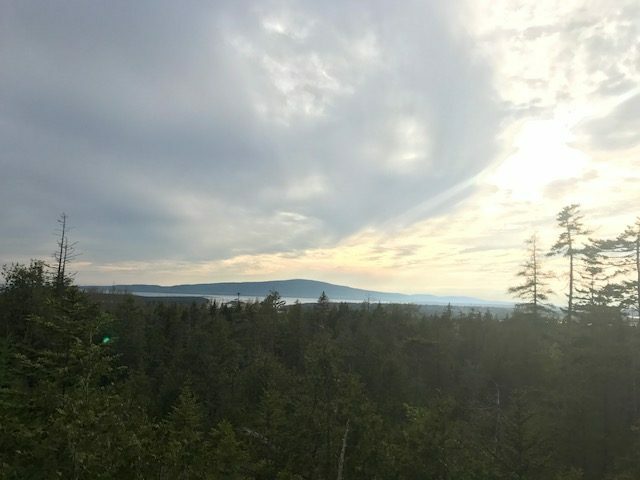 View from the bicycles of Eagle Lake in Acadia. Farther along on the bicycles we came to Jordan Pond. 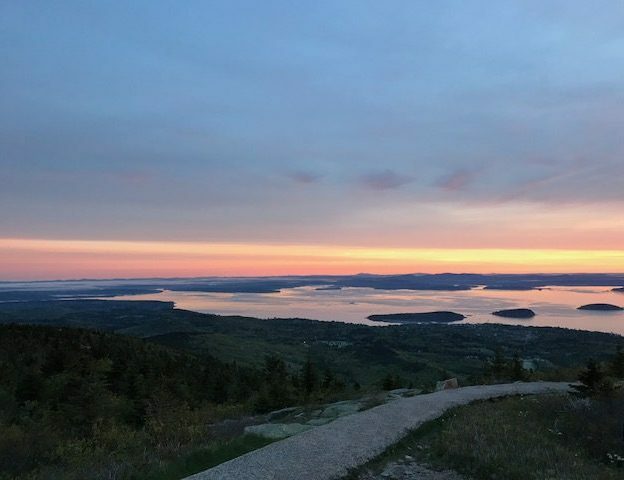 Cadillac Mountain is the first place in the continental US to experience dawn, so we had to be there for the experience! Unfortunately, since the sun rises just before 5 that meant that our alarms sounded all too early and we had to hop on the motorcycle for the chilly ride. Hitting snooze too many times, we just barely made it for the sunrise itself, though the colors in the sky during our approach were spectacular and well worth the early start. It was a cloudy day, which kept it cool and limited views but made for dramatic, scarlet colors during the sunrise. Once the sun was up we stayed on the peak while making tea and eating a light breakfast. 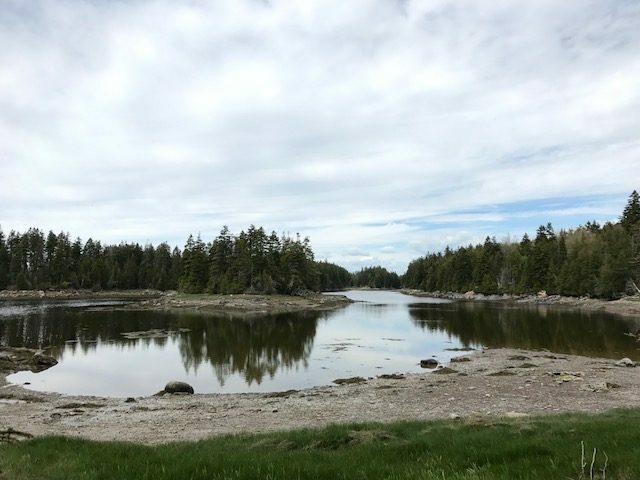 After eating we hopped back on the motorcycle to complete the loop road and explore a bit more before migrating over to another section of the park, the Schoodic Peninsula, the quieter and less visited area of Acadia. 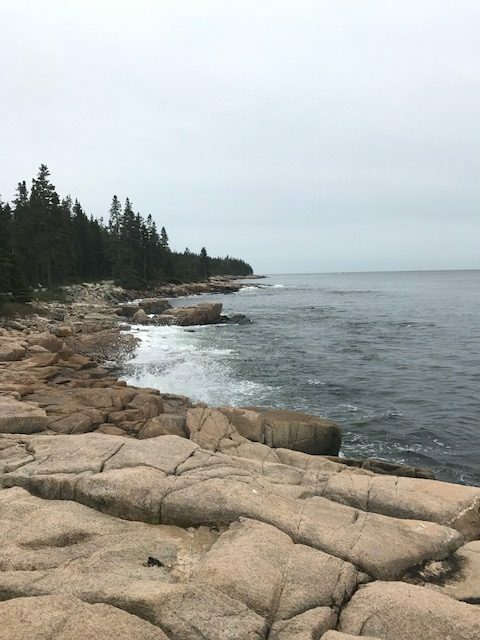 Schoodic Woods Campground is only a couple years old and we really enjoyed being somewhere that looked new! It’s probably one of our favorite campgrounds of the last couple years with big, private sites and easy access to biking and hiking trails. We were also among the first to pull in this year, since it was opening day of the season, and the rangers and volunteers were in exceptionally good spirits. After settling in we grabbed our bags and headed out to explore some of the nearby hiking trails. The next morning we set out on bicycles to check out the one-way loop around the peninsula. 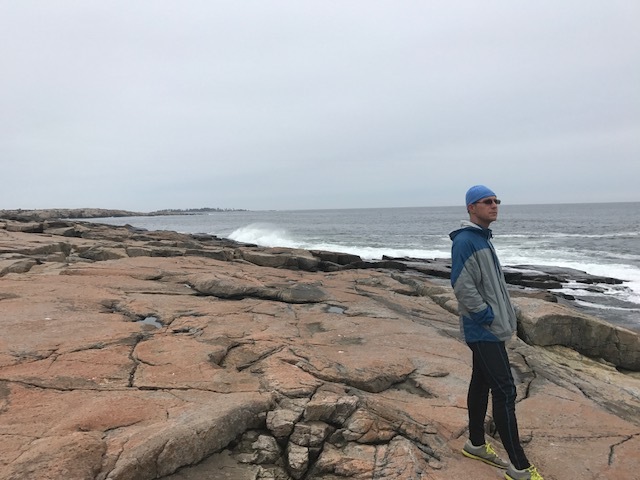 It runs along the coastline, so we got to enjoy crashing waves and views of the mountains across the harbor almost the whole ride. Rain was moving in for the afternoon, so it was overcast and windy – the cool temperatures and threatening rain kept us moving along. 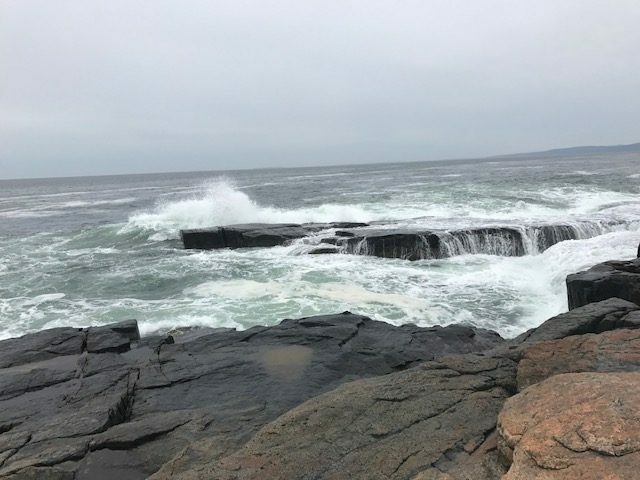 We stopped to explore the visitor center at the Schoodic Institute Education and Research Center, learning about the Naval Communications Base that was there until just recently and the various education opportunities afforded. The wind seemed to be picking up so we beelined back to the RV. Just after returning we noticed the first few raindrops falling, so our timing worked out quite well! * all 47 National Parks in the Contiguous US!! * each of the lower 48 States! 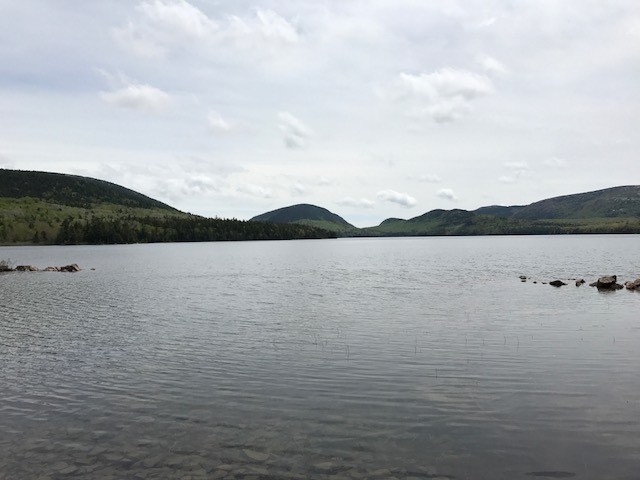 Our visit wasn’t nearly long enough, but we forgot to take into account Memorial Day Weekend when making our reservation and the impending hoards of campers flocking to the campgrounds… so we ended up heading into New Hampshire, aiming for the White Mountain National Forest. 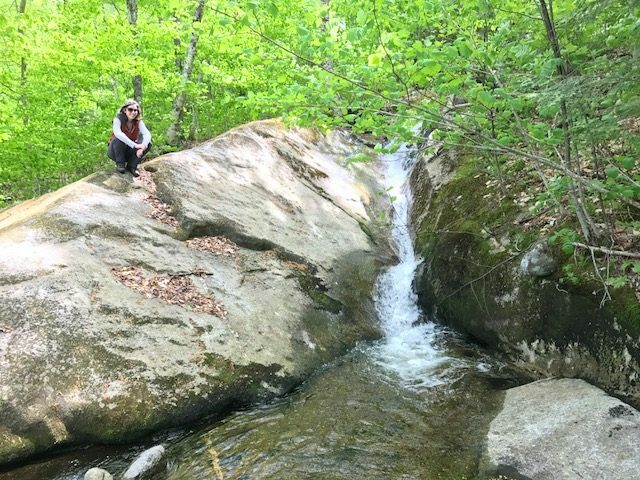 We didn’t have high expectations of finding a campsite, but luckily did manage to find a delightful spot in a forest campground off the Kancamagus Highway (I still don’t know how to pronounce this), where we tucked in for the weekend. It seems that we beat the bulk of the crowd. Whew! 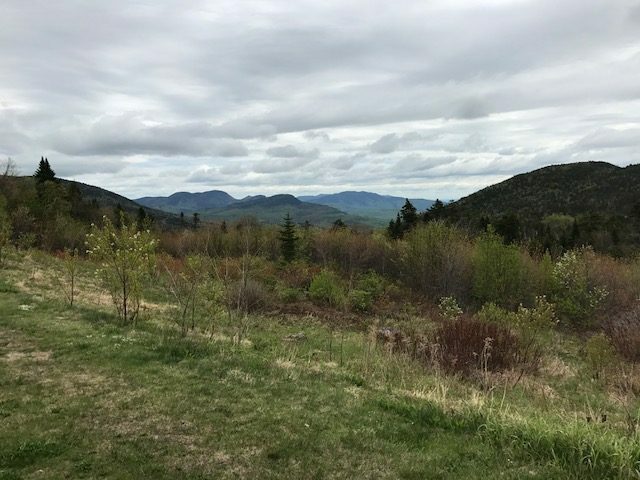 Saturday morning we hopped on the motorcycle for a trip along the White Mountains Trail, a national scenic byway. 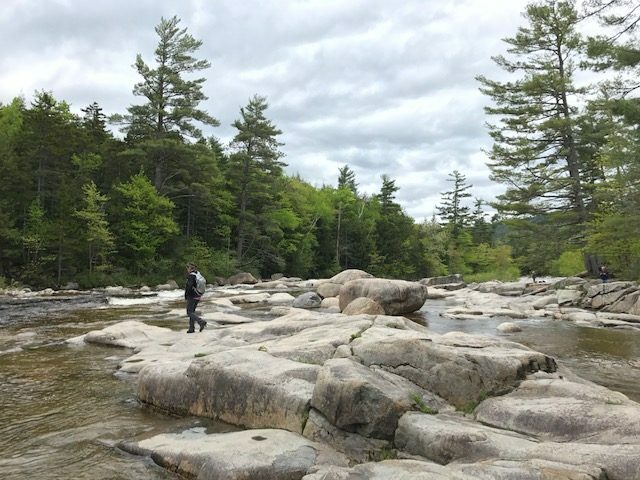 It heads along the Kancamagus Highway through the mountains. As in Maine, the views are spectacular, with the spring foliage and flowers exceeding expectations. We’ve enjoyed the rural sections of New England more than expected. It reminds us of the Pacific Northwest a little, except less crowded, which greatly appeals to us. We do hear horrible things about the bugs, which we’ve been able to miss thus far between cool temperatures and windy days, so there’s always that to consider. A completed journey and full map – well mostly, just ignore Hawaii and Alaska down there – adventures for another date. Longer-term plans are still in the works, with a variety of options being considered. 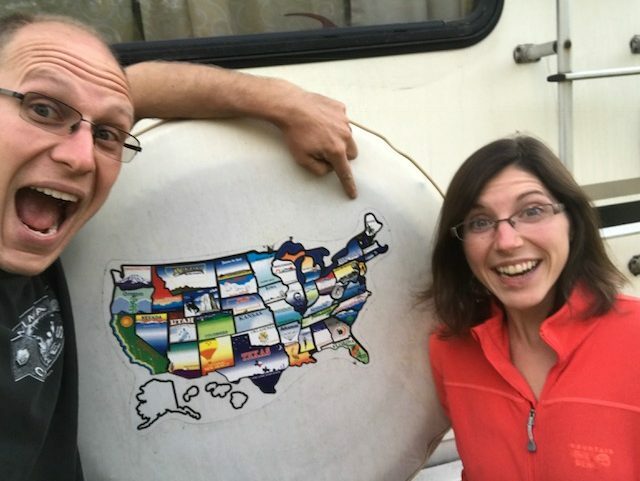 Until then, we’re basking in our completed quest of visiting each of the Lower 48 states and the National Parks there-in. If there is one thing we’ve learned from our journey, it’s that there is still so much to explore and our options are limitless.